Augos the All-Seeing is a cultist of the Order of the Storm Branch. They have been added in the second episode of the AC Odyssey Legacy of the First Blade DLC, Shadow Heritage. To find Augos the All-Seeing you first have to find out where to find the clue leading to her. Fortunately, you’ll run into it while hunting for one of the other cultists of the Order of the Storm. Our AC Odyssey Legacy of First Blade Augos the All-Seeing Cultist Location guide will show you how to get the clue leading to Augos the All-Seeing, and where to find her once you do uncover her. 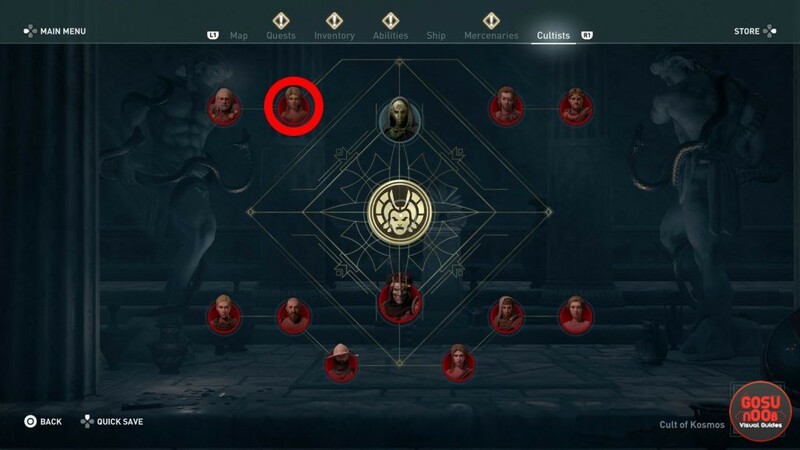 Augos the All-Seeing Cultist Clue Location in AC Odyssey Shadow Heritage DLC – How to Get? The location of the Cultist Clue that reveals Augos the All-Seeing is, in fact, another cultist. The cultist in question is Nestor the Formidable. For a detailed description on how to get him, check out our Legacy of First Blade Cultist Clue Location – Olouros Fortress guide. Here’s the quick rundown, in case you need it. Basically, you have to find the clue leading to Nestor, which is in Olouros Fortress. It’s on the ground floor of one of the towers in the fortress. Nestor is going to be waiting for you in the middle of the sea, north of Achaia. Prepare yourself for a naval battle. Once you kill him, you’ll get the clue leading you to Augos the All-Seeing. Where to Find Cultist Augos the All-Seeing in AC Odyssey Legacy of the First Blade? To find the Order of the Storm Cultist called Augos the All-Seeing, you’ll have to go to the town of Pellene. It’s the town in the west of Scavenger’s Coast. The easiest and fastest way to get there is to fast travel to the Statue of Poseidon synchronization point. From there, you’re pretty much in Pellene already. All that’s left from there is to find Augos the All-Seeing by following the Cultist icon on the screen. When we found her, Augos was completely alone, with no guards or anything. One of the easiest assassinations we’ve come across. Just confirm the kill and be on your way. And, well, that’s basically all there is to locating Augos the All-Seeing, and then assassinating her. In case you need help with anything else in Legacy of the First Blade and Episode Shadow Heritage, we’ve got you covered with other articles. Among others, we’ve got Shipwreck Cove Cultist Clue Location, How to Start Legacy of the First Blade DLC Episode 2, and Legacy of The First Blade Endings – Can You Avoid The Baby.